Sawtooth Range along the Sawtooth Scenic Byway near Stanley Idaho. 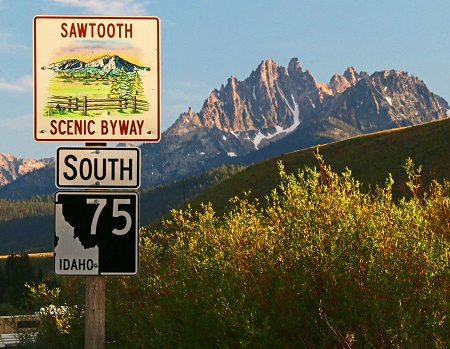 Falls, Idaho), the Sawtooth Scenic Byway takes its travelers along the Salmon River, drives along the east side of the magnificent Sawtooth Mountains, gives travelers access to the Sawtooth National Recreation Area and the Sawtooth Wilderness. The Sawtooth Scenic Byway of Idaho also takes travelers up and over the incredibly scenic pass of Galena Summit, and passes through the world-class resort towns of Sun Valley and Ketchum Idaho, which provides some of the best resort experiences in the nation, including fantastic ski resorts, dining, lodging and shopping. 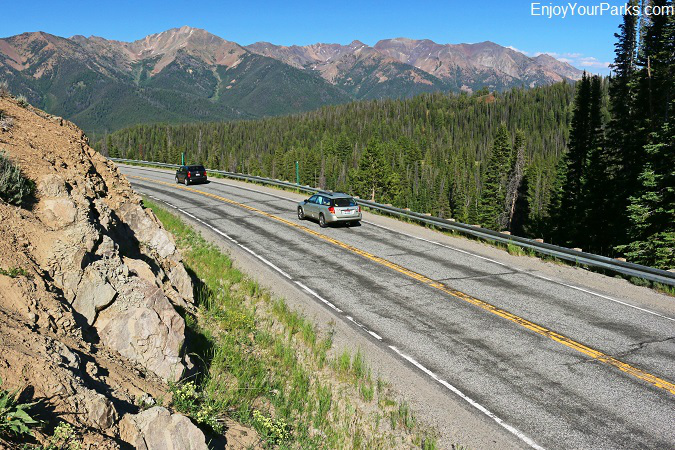 Running along Idaho State Highway 75, the Sawtooth Scenic Byway is 116 miles long, and has up to 6% grades as the highway climbs up and over Galena Summit. The road is open all year long but be prepared for severe snow conditions on Galena Summit during the winter months. 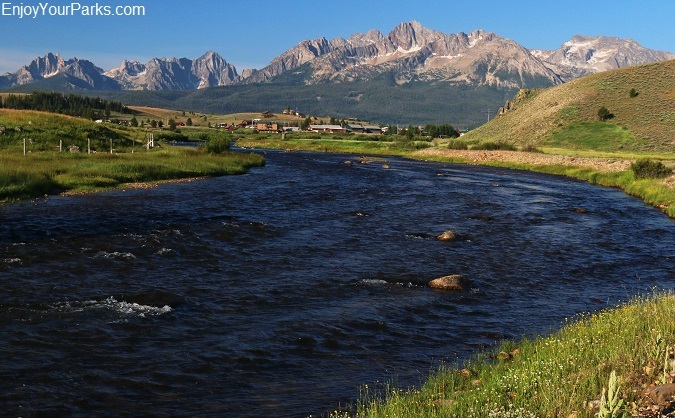 Salmon River near Stanley Idaho, with the Sawtooth Range in the background. Stanley Idaho is known as the "Gateway to the Sawtooth Wilderness", as well as several other world-class outdoor adventures as it rests in the heart of some of the most popular and classic white water found in the state of Idaho, and is a major reason Idaho is referred to as "The Whitewater State". Located near the headwaters of both the Salmon River and the South Fork of the Payette River, as well as being the "jumping off point" for the 100 mile long wilderness canyon on the world famous Middle Fork of the Salmon River through the Frank Church-River of No Return Wilderness, Stanley Idaho is where thousands of whitewater rafters and kayakers come to begin their river adventures. 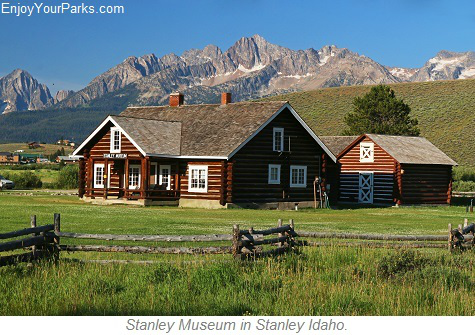 Stanley Idaho is known as the "Gateway to the Sawtooth Wilderness". Museum located on the outskirts of Stanley that is a great place to learn about the amazing history of this fascinating area. 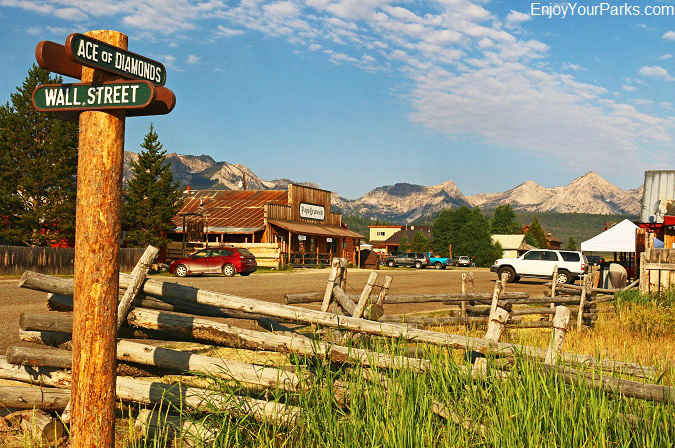 Being the "Gateway to the Sawtooth Wilderness", Stanley Idaho is essentially the headquarters for hundreds of hikers, backpackers and mountain climbers eager to enter the fabled Sawtooth Wilderness to the southwest. There are hundreds of miles of outstanding hiking trails and back country camping opportunities throughout this remote wilderness area, as well as phenomenal mountain climbing adventures. 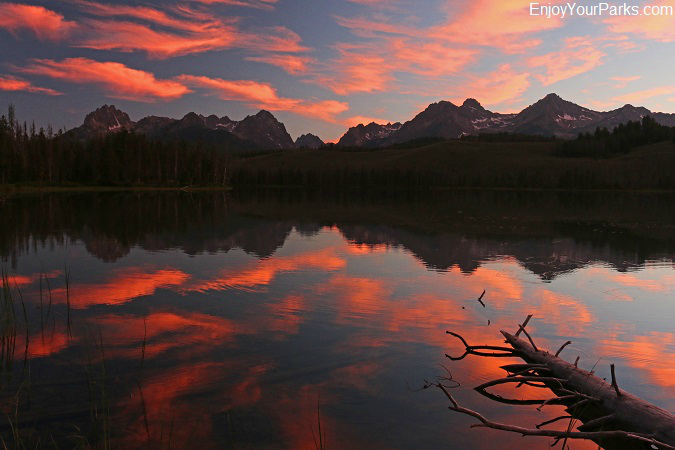 Also located just south of Stanley is the main entrance to the spectacular Sawtooth National Recreation Area, which provides unbelievable outdoor recreational opportunities for visitors of this incredible area. Stanley Lake near Stanley Idaho, in the Sawtooth National Recreation Area. 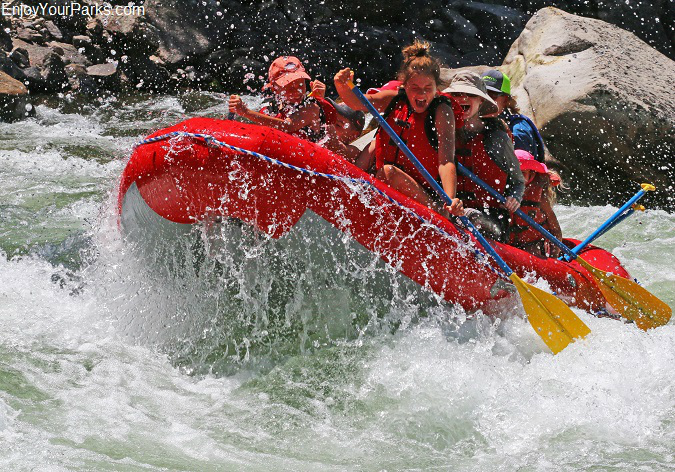 The Salmon River near Stanley Idaho is world famous for its white water rafting opportunities! 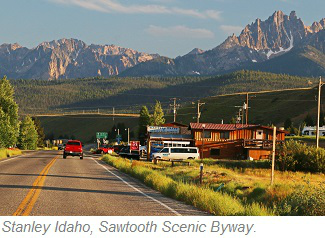 Sawtooth Scenic Byway in Idaho. peaks over 10,000 feet above sea level, with Thompson Peak being the highest peak in the range at 10,751 feet. There are an additional 77 peaks having elevations between 9,000 and 10,000 feet above sea level, so as you can imagine, once a hiker or mountain climber enters the Sawtooth Wilderness Area, they are surrounded by literally an "ocean" of jagged peaks that make it impossible to take a bad photograph no matter where you point your camera. 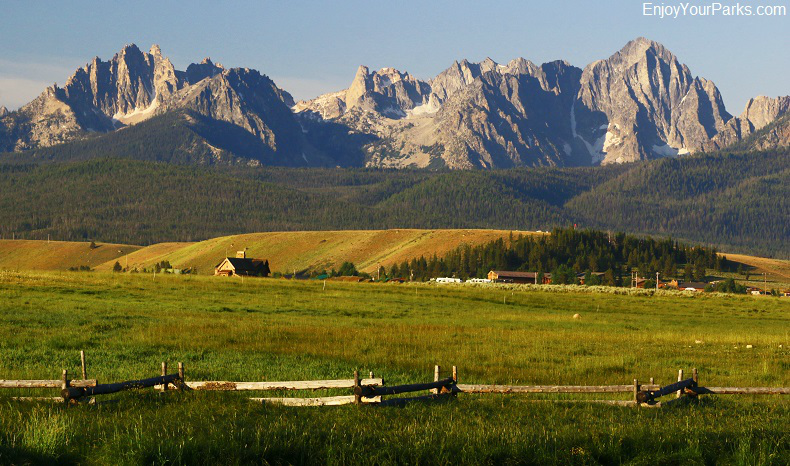 Geologically, the Sawtooth Mountains are igneous in composition, being the result of the erosion of the Eocene Sawtooth Batholith. As the batholith was cut by several Ice Ages, the end result was incredibly jagged granite peaks and spires that are so amazingly scenic you'll burn through way more memory cards in your camera than you could have ever anticipated. 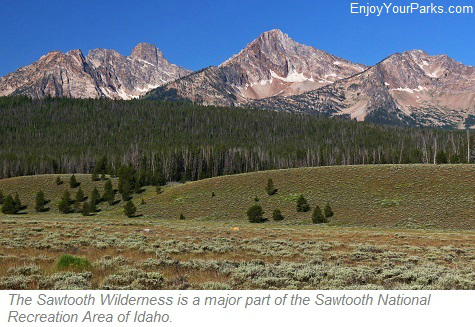 Sawtooth Mountain Range is in the heart of the Sawtooth Wilderness. for mountain climbing opportunities. 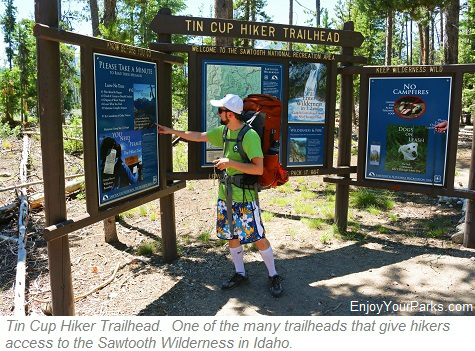 Most of the trails were constructed in the 1960s, and these well-maintained wilderness trails provide access to some of the most scenic and remote country in Idaho and beyond. to the south. All of these rivers eventually reach the Snake River and onto the Columbia River where the majority of the water from the Sawtooth Wilderness finally reaches the Pacific Ocean. In addition to rivers, lakes and streams, there are about 204 perennial snow fields that usually hold on all year long, and are remnants of alpine glaciers of the past. These glaciers of the past, with some existing up until the 1850s as part of the Little Ice Age, left their mark with glacial lakes, horns, moraines, cirques, aretes and hanging valleys...which are all classic glacier-made landscapes. Stanley Idaho is the closest and most popular area to access the trail system of the Sawtooth Wilderness, but the towns of Atlanta and Sawtooth City also provide excellent access points to this fantastic wilderness area. Redfish Lake in the Sawtooth National Recreation Area along the Sawtooth Scenic Byway in Idaho. borders, which are the Sawtooth Range, Boulder Ranges, White Cloud Ranges and Smokey Range, and provides its visitors with jaw-dropping scenic landscapes in all directions. 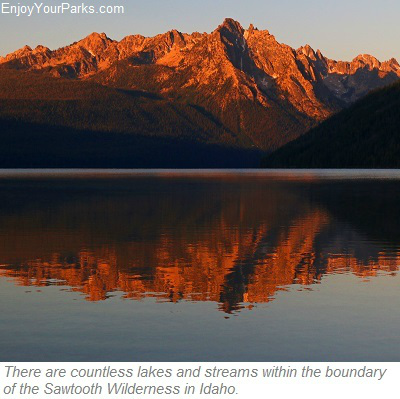 The Sawtooth National Recreation Area has over 1,000 high mountain lakes, and is home to the headwaters of four of Idaho's major river systems, which are the South Fork of the Payette River, Salmon River, Boise River and the Big Wood River. 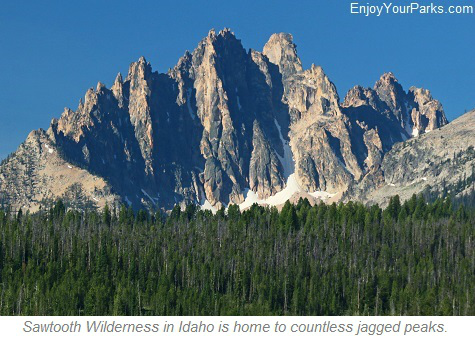 All of the Sawtooth Wilderness is included in the massive Sawtooth National Recreation Area, as well as the surrounding areas. 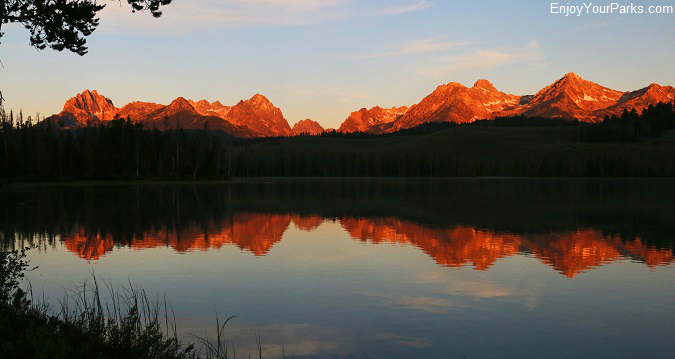 Naturally the Sawtooth National Recreation Area is perfect for just about every outdoor activity you can think of, including hiking, backpacking, mountain biking, mountain climbing, fishing, boating, kayaking, canoeing, wind surfing and much, much more. 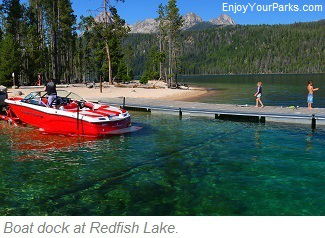 Redfish Lake is a major recreational area within the confines of the Sawtooth National Recreation Area, and is located just 5 miles south of Stanley Idaho just off Idaho State Highway 75. The junction that leads to Redfish Lake is obvious and the road is paved. 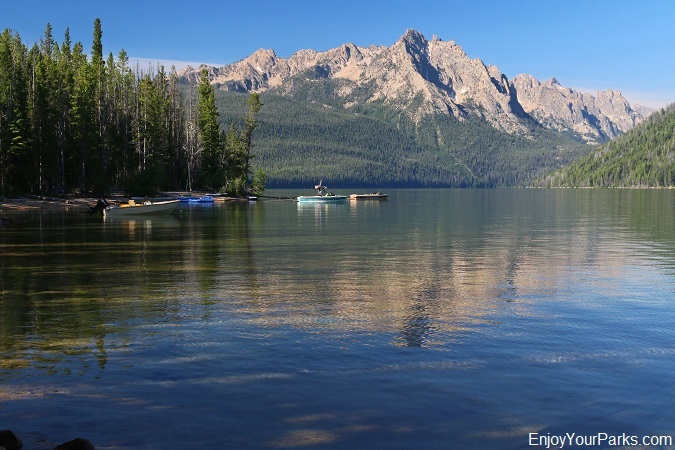 Redfish Lake rests at 6,547 feet above sea level, and has a maximum depth of 387 feet. There is 11 miles of shoreline, as it is about 7.2 miles long and 3/4 of a mile wide. There is a trail that takes hikers completely around the lake which is 17.5 miles long. 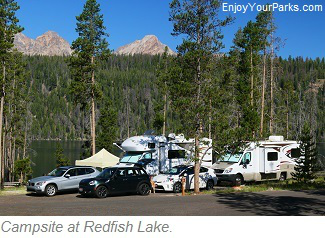 Redfish Lake has fantastic campgrounds along the shore, as well as marinas and boat docks! Redfish Lake Campgrounds, Marinas, Boat Docks, Picnic Areas, Beaches! 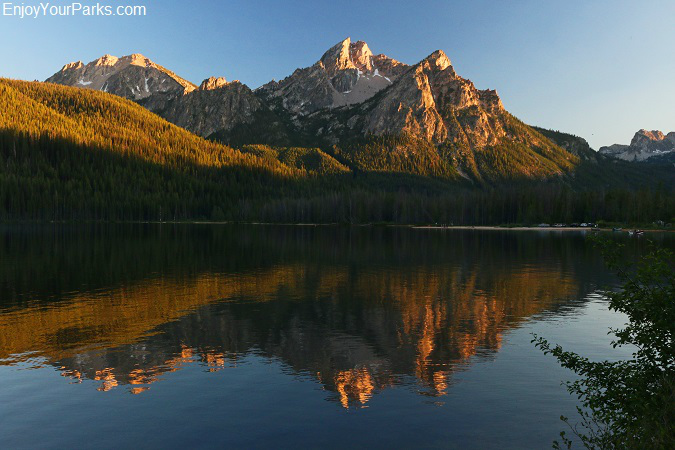 have the Sawtooth Mountains dominating the western and southern skyline, with Mount Heyburn (10,229feet) and Grand Mogul (9,733 feet) being the prominent peaks above Redfish Lake. 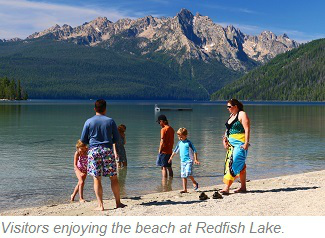 The campground and picnic areas also have some absolutely wonderful sandy beaches along Redfish Lake for visitors to enjoy, as well as a hiking trail that takes visitors all the way around the lake. And by the way, the trailhead to the easiest route to Thompson Peak, which is the tallest peak in the Sawtooth Range, is located at the Redfish Lake Trailhead. 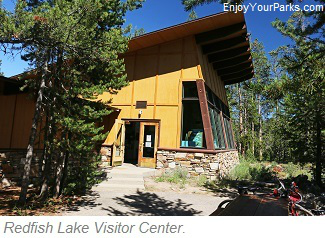 There is a very nice Visitor Center located at the north end of Redfish Lake which is extremely helpful in making sense of a very extensive and complex national recreation area. 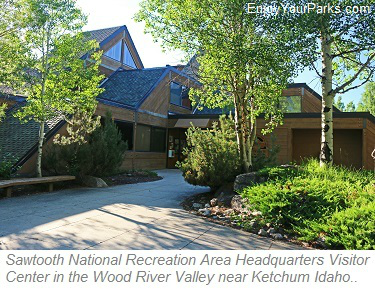 We highly recommend that you spend time at the Redfish Visitor Center if you're interested in exploring the Sawtooth National Recreation Area, as the staff is always happy to answer any questions that you may have, as well as showing you all the most popular destinations in this extensive area. Redfish Lake with the Sawtooth Range in the background. The Galena Summit along the Sawtooth Scenic Byway. Sawtooth Mountains and the broad valley to the east of the range from the outstanding vista of the Galena Overlook. At an elevation of 8,701 feet above sea level, Galena Pass is located in the Boulder Mountains and lies within the Sawtooth National Recreation Area. The Galena Overlook (8,400 feet) lies just west of the true summit, and there are very nice interpretive signs explaining what you are looking at in this gorgeous scenic overlook. 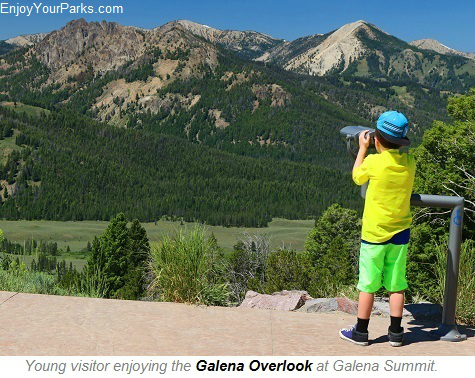 Also from the Galena Overlook visitors can actually see the headwaters of the Salmon River. Without a doubt you will want to spend some time at the Galena Overlook... the views are very impressive and worth your time to enjoy. 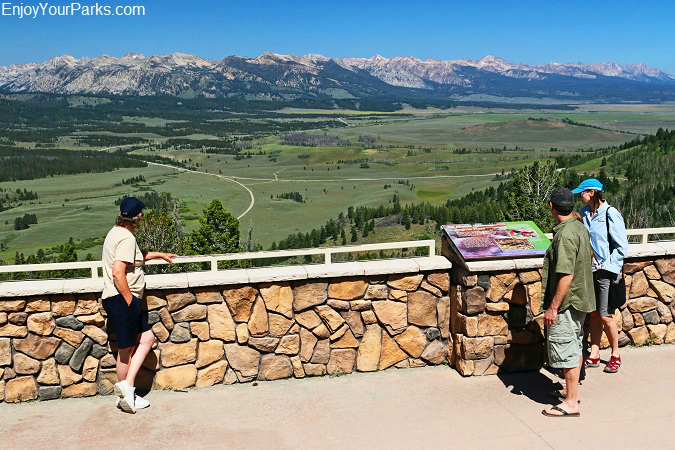 The Galena Overlook on the Galena Summit provides a spectacular view of the Sawtooth Mountains. 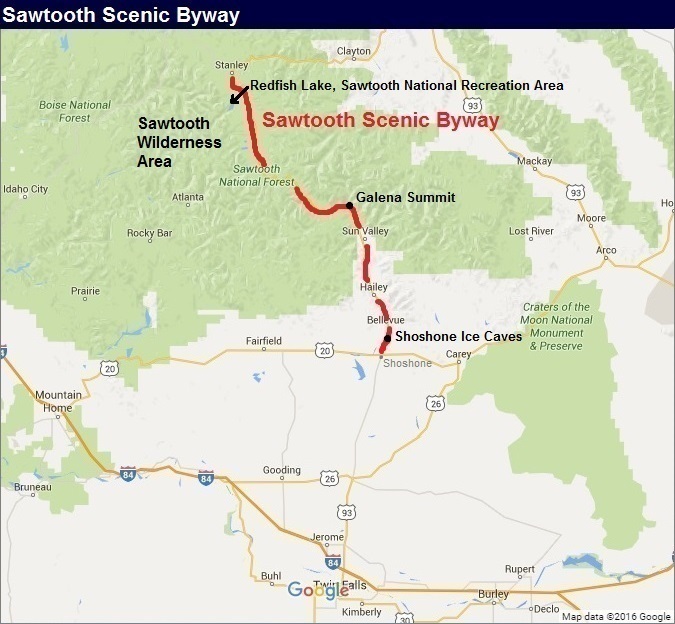 About 28 miles south of Galena Summit along Idaho State Highway 75 you will encounter the Sawtooth National Recreation Area Headquarters Visitor Center. 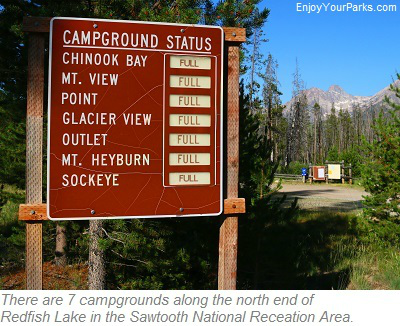 This impressive facility is an outstanding resource for visitors to learn all about the Sawtooth National Recreation Area, and is only a few miles north of Ketchum Idaho in the Wood River Valley. The helpful staff will show you exactly where to go and what to do, depending on your interests. As we've stressed earlier, the Sawtooth National Recreation Area is HUGE and you really need to visit this outstanding visitor center to help simplify this extremely complex area. Sun Valley Idaho with Bald Mountain ski area in the background. 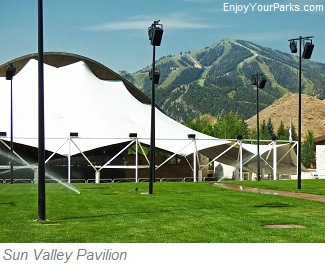 The world renowned Sun Valley / Ketchum Area, collectively known as "Sun Valley", is one of the top resort destinations in the country. 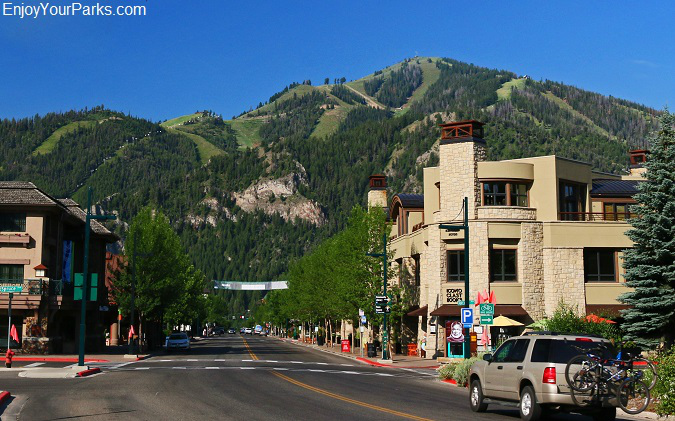 Located in the Wood River Valley, both the resort town of Ketchum and the adjacent resort town of Sun Valley share a number of resources, such as the world-famous ski area on and around Bald Mountain. This world-class ski area draws winter sport enthusiasts from all over the world, and is regarded by many as one of the top ski resorts on earth. 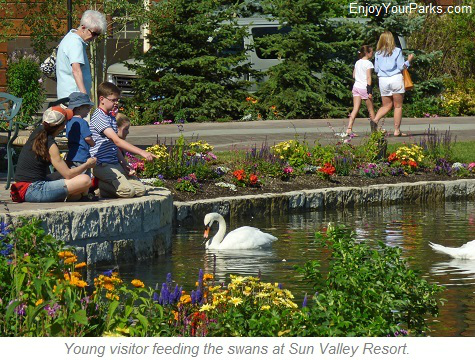 And during the summer, tourists enjoy the incredible fishing, trail riding, tennis, hiking, restaurants, art galleries, shopping and much more. The airport that services the nationwide and international visitors is found in the town of Hailey Idaho, located 15 miles to the south. 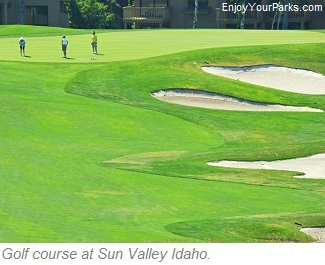 So if you enjoy world-class resorts and all that goes with them, you will definitely want to spend plenty of time in the wonderful resort towns of Ketchum and Sun Valley Idaho along the Sawtooth Scenic Highway. 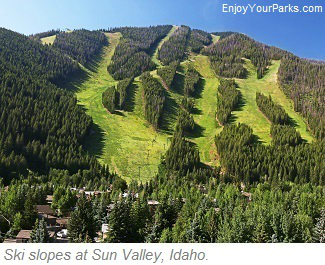 The Sun Valley area is among the top resort destinations in the country. In the late 1930s, the legendary novelist Ernest Hemingway and his family made Ketchum Idaho their seasonal home, which is also where he committed suicide and was buried in the Ketchum Cemetery. 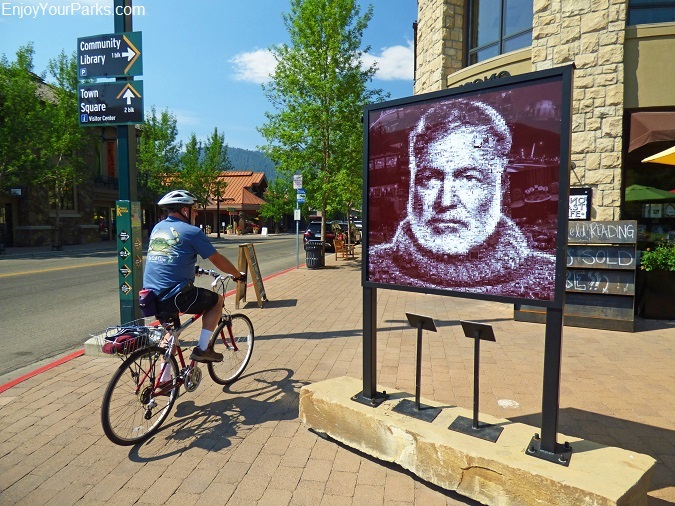 When the Hemingways made Ketchum their seasonal home, this news instantly sparked a wave of awareness for many more rich and famous people, and they too made Ketchum Idaho their seasonal homes. Ketchum and Sun Valley has been a hot spot for the rich and famous ever since. 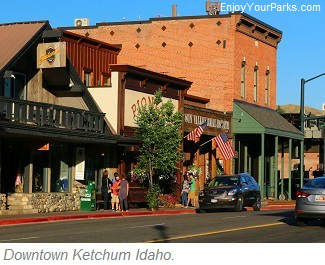 The resort town of Ketchum Idaho is one of the top resort destinations in the country, and was also the home of Ernest Hemingway. 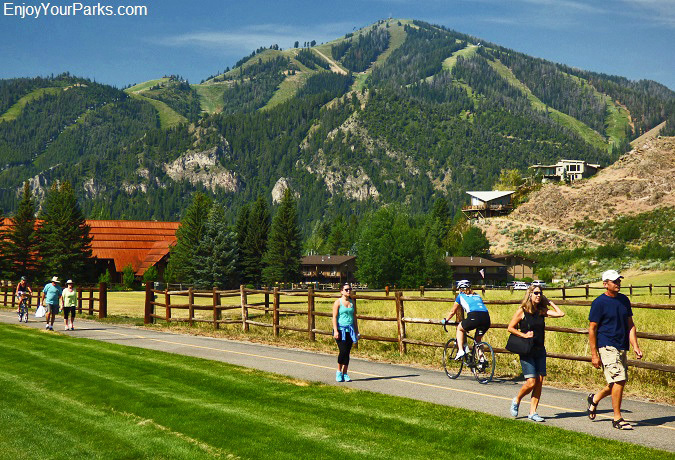 Visitors enjoying the horses along a walking path in Sun Valley Idaho. 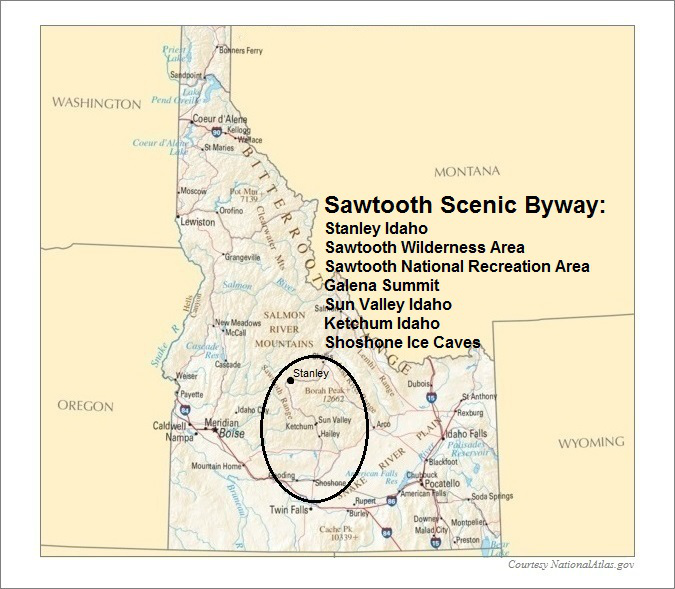 About 38 miles south of the Sun Valley area and 16 miles north of Shoshone Idaho along the Sawtooth Scenic Byway lies the Shoshone Ice Caves. 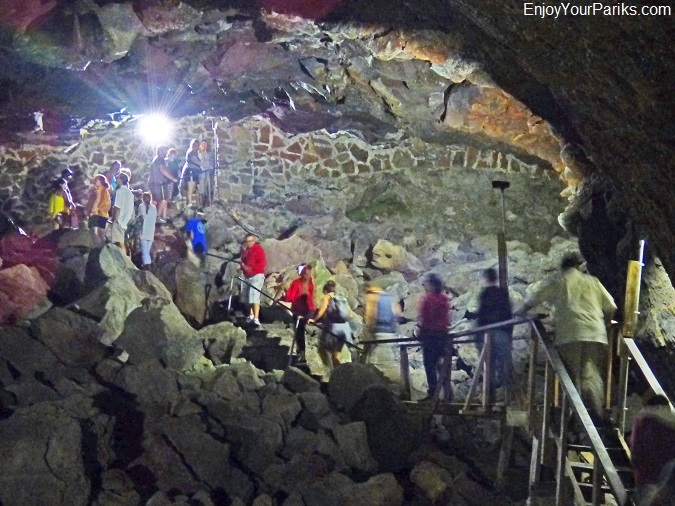 These fascinating caves are part of the same volcanic geology of the Craters of the Moon National Monument, and are a popular tourist destination for those visitors traveling along the Sawtooth Scenic Byway. The Shoshone Ice Caves are not known for their beauty, but instead the fact that even during the intense heat of summer, there is a large lake of ice along the floor of this fascinating cave. 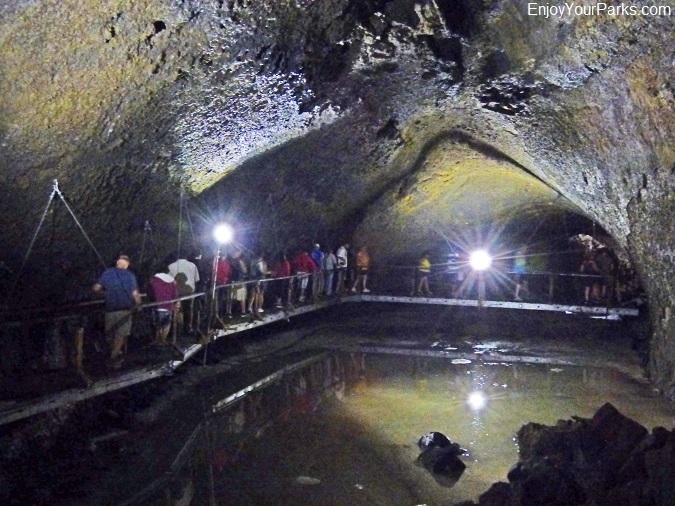 The Shoshone Ice Cave is actually a lava tube that is 1,000 feet long and anywhere between 9 and 31 feet in height. No matter what time of year, the Shoshone Ice Cave maintains a constant temperature of 50 F. The ice is created by air currents flowing through the lava tube, causing the water to freeze. 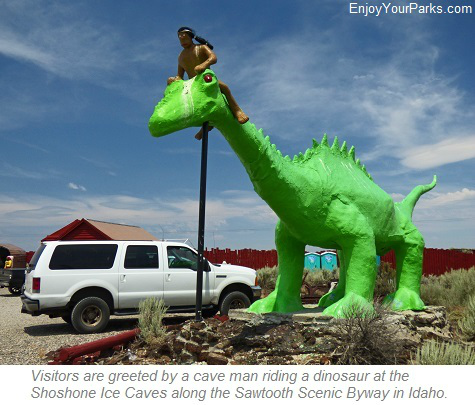 When you approach the parking area of the Shoshone Ice Caves, you can't help but notice the large green dinosaur with a hairy cave man riding it. There is a gift shop and museum on the grounds, and is where you can sign up for a guided tour of the caves. 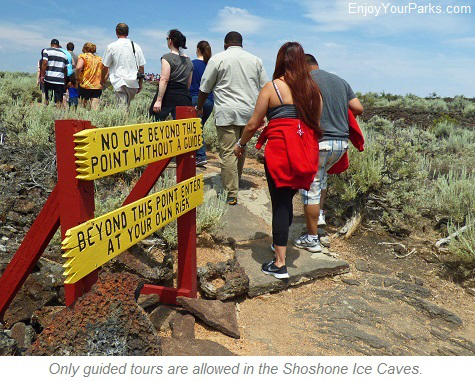 The Shoshone Ice Cave Guided Tours are very well done, quite interesting as well as quite entertaining. Make sure you wear a coat during the tour, because even though it might be 95 degrees (F) at the parking lot, the cave is gonna be chilly! 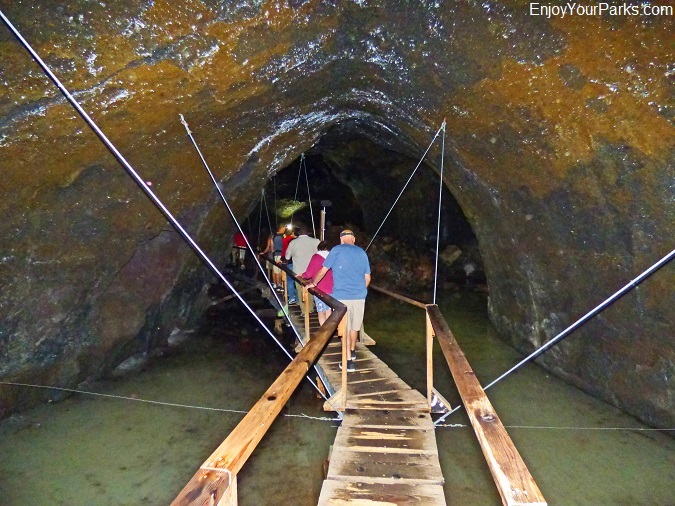 Visitors about to enter the Shoshone Ice Caves with their tour guide. Visitors walking on the cat walk above a lake of ice in the Shoshone Ice Caves in Idaho. Another view of the cat walk above a lake of ice in the Shoshone Ice Caves. 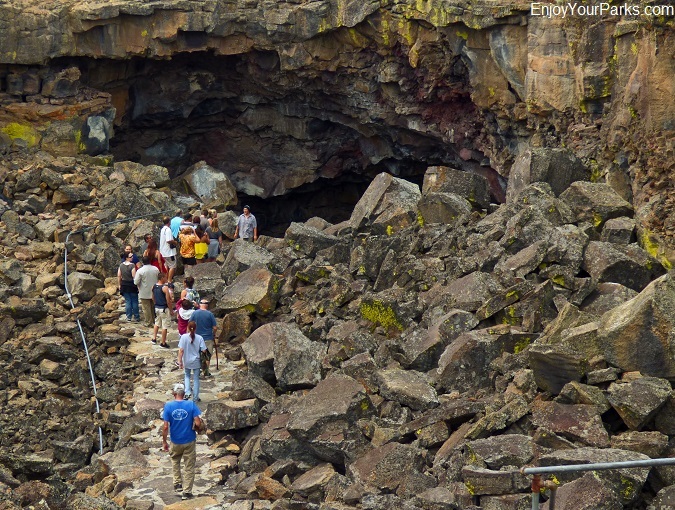 Visitors heading back to the entrance of the Shoshone Ice Caves after an entertaining and fascinating tour. 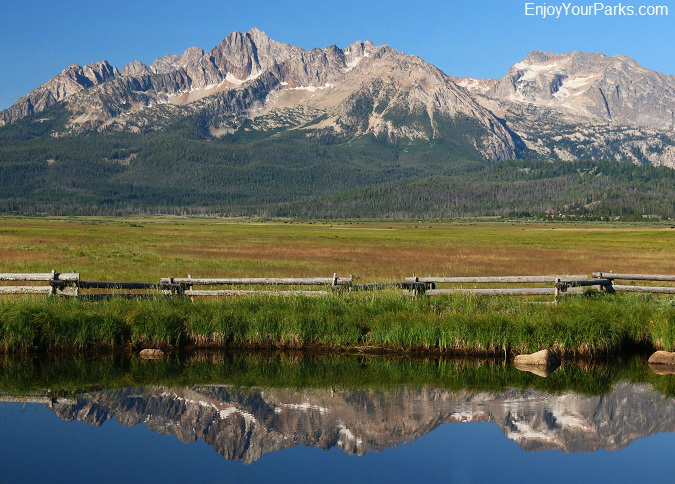 enjoy is the spectacular view of the Sawtooth Range directly to the south as the Ponderosa Pine Scenic Byway heads west. 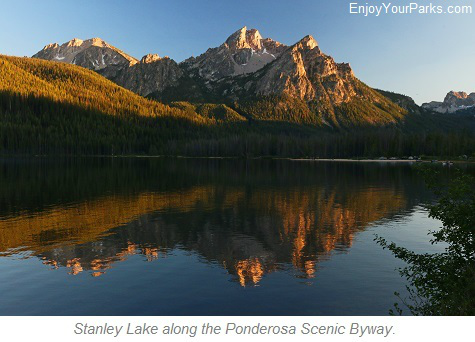 One of the most scenic highlights of the Ponderosa Pine Scenic Byway is only about 8 miles west of Stanley Idaho, which is the gorgeous Stanley Lake. especially if Stanley Lake is calm and the peaks are reflecting in it. 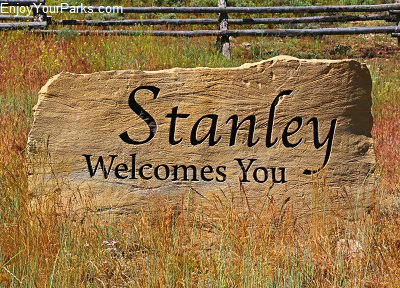 There are some very nice campgrounds around Stanley Lake, and we highly recommend spending some time here...if only to enjoy the scenery. Just beyond the junction to Stanley Lake, highway 21 climbs in elevation and soon reaches Banner Summit at 7,056 feet above sea level. 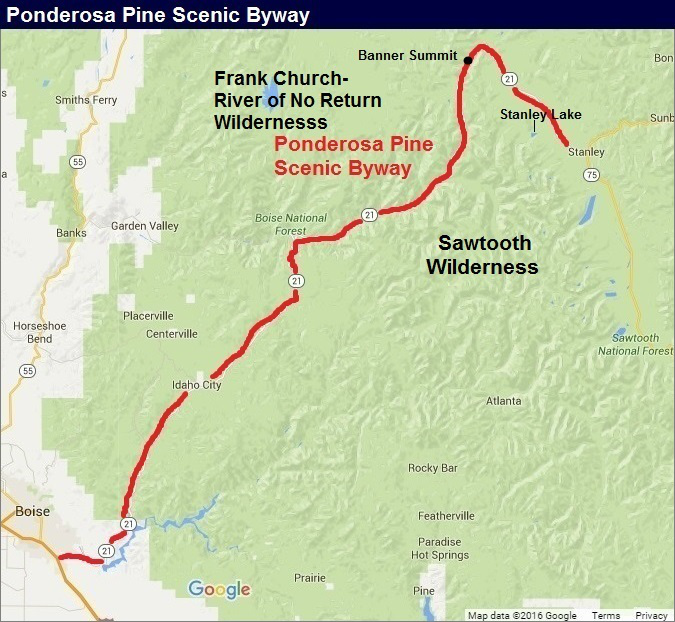 The Ponderosa Pine Scenic Byway then squeezes between the Sawtooth Wilderness to the left (east) and the Frank Church-River of No Return Wilderness to the right (west). Further south the road will then follow the fabled South Fork of the Payette River, and then onto the historic gold rush town of Idaho City (where you can still pan for gold) before reaching Boise which is 47 miles further to the south.